Diego de la Vega and his bodyguard, Django Freeman, get a firsthand look at the brutal tyranny wielded by the Archduke of Arizona in his drive to construct a railroad line across the length of his realm. Django is still trying to reconcile his first sighting of the masked and mysterious avenger known as El Zorro. Could this strange, black-clad apparition really be the proper and elderly gentleman who has hired him as a bodyguard? 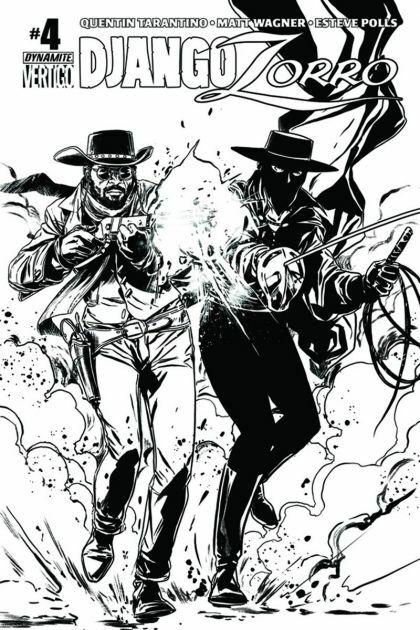 Quentin Tarantino and script-writer Matt Wagner continue the excitement along with artist Esteve Pols in this one-of-kind mini-series, the official sequel to the movie, DJANGO UNCHAINED.